I felt like trying out a silly little recipe this evening, so corndog muffins it was! I made a few changes. First I cut the recipe in half, only using 1 small package of corn muffin mix and 4 hot dogs. Second, I cut the hot dogs into small pieces. Note: I used cupcake liners, sprayed with Pam, which was a mistake. Use a good non-stick muffin pan instead. You can serve these with a little yellow mustard or ketchup if you'd prefer. Enjoy! 1. Preheat oven to 400 degrees F (200 degrees C). Lightly grease muffin tins. 2. Stir together the cornbread mix and the brown sugar in a large bowl. Whisk the eggs and milk in a small bowl until smooth. Fold the eggs and cheese into the dry mixture until moistened. 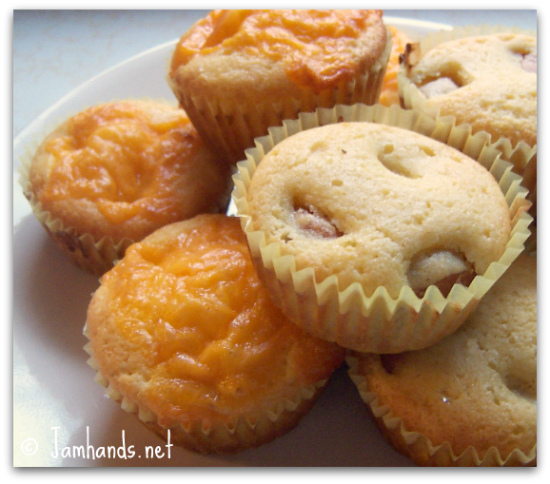 Spoon mixture into muffin tins until 2/3 full. Add 1 hot dog half to each muffin. 3. Bake in a preheated oven 14 to 18 minutes, or until golden brown. They look like very tasty little snacks. And bring on the cheddar! Know what it means when you don't have to put cheese on some for your husband.......more for you! call me crazy (or a kid at heart!) but i love love love this recipe! going on my to-try-list! i'm hosting a blog hop called mangia mondays & i would love you to share this and any other recipe you may have! Though it sounds odd, I add a half-package of Lawry's Spaghetti Seasoning mix to my baked corn dog muffins. It's a tip I borrowed from Sandra Lee's Semi-Homemade deep-fried version ---- the taste is something like that of a midway/county fair corn dog. I use a 10 oz. box of Jiffy corn bread mix, 3/4 cup milk, 1 egg, and the spaghetti seasoning for the batter. No cheese or brown sugar, and I dice/slice/chop the hotdogs. Yum!